Attend the Around the World Through Books event presenting Barbara Kingsolver’s book, Animal, Vegetable, Miracle: A Year of Food Life! How to get there? Shuttle service provided to and from- call Kelly Plantan at 523-5810 to reserve your seat. What? Take a tour of the sustainable agriculture garden at Western campus…eat locally grown popcorn and drink locally grown apple cider…hear a discussion of Kingsolver’s recent book, Animal, Vegetable, Miracle, presented by Cindy Conner and the Sustainable Agriculture Club. See a book display in the library; it will help you learn how to grow your own food. Learn! 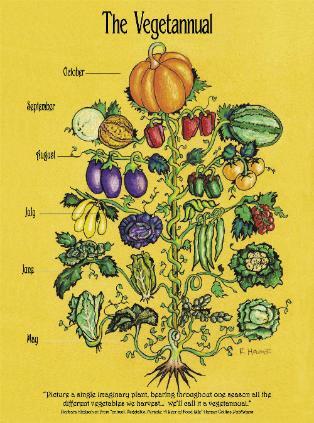 What is a “vegetannual”? View the book website to learn all about the book, the family who lived it and wrote it, and even get free recipes, including one for zucchini chocolate chip cookies!